The tradition of having a Mascot for a FIFA World Cups was first started in 1966 FIFA World Cup held in England. It was named "Willie" representing a lion, a typical symbol of the United Kingdom. The Mascots are frequently one or more anthropomorphic characters targeted at Children with cartoon shows and other merchandise. 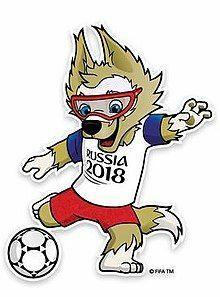 Zabivaka the Wolf was the Mascot for the 2018 FIFA World Cup Football held in Russia in 2018. It won over Tiger (27%) and Cat (20%) with 52.8% votes in a Nationwide poll in which over a million votes were cast in September 2016. The competition results were announced on 22 Oct 2016 and Zabivaka was declared winner during Vachernily Urgent (Evening Urgant) TV Programme on Perviy Kanal. The Wolf’s author is a graphic design student at Tomsk State University Ekaterina Bocharova. Zabivaka is a Russian name for a Eurasian Wolf which translates as a Goalscorer. Zabivaka wears red shorts and a blue and white T-shirt inscribed with the words "Russia 2018".This was the colour combination of the Russian team. Russia issued a set of three unique stamps on Zabivaka the Mascot for the 2018 FIFA World Cup Football. The stamps were issued as Happy New Year stamps on 01 Dec 2017. Each stamp had a different theme. 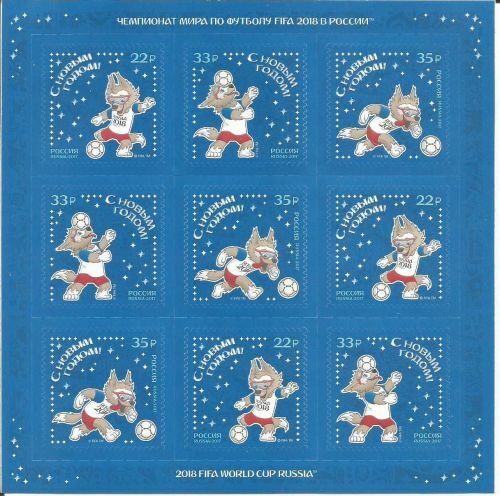 The 22 Roubles stamp features Zabivaka Strike the Ball. The second stamp was a 33 Roubles stamp with Zabivaka having the Ball on the Head. The third stamp was a 35 Roubles stamp in which Zabivaka is seen running with the football. Each stamp had a print run of 6,600,000 stamps each. Another unique mini sheet was also put on sale which contained a total of nine stamps (three stamps on each variety). 220,000 mini sheets were printed as collectors souvenirs.